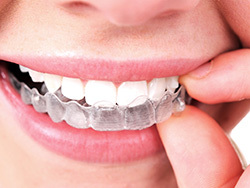 For well over a decade, Invisalign clear braces have been providing patients with an alternative to traditional orthodontic treatment for fixing problems with crooked teeth and bad bites. We are a certified provider of Invisalign clear braces, offering this comfortable and clear choice for fantastic orthodontic results to Creve Coeur and surrounding communities. Why choose Invisalign clear braces? Invisalign clear braces are created using computer aided design, which is how we get such a precise custom fit for your clear Invisalign aligners. These orthodontic appliances allow you to straighten your smile without the metal brackets and wires of traditional orthodontics, which can cause embarrassment at your smile’s appearance and discomfort from soft tissue irritation. With Invisalign clear braces, we can close gaps, correct misalignments, improve your bite, and straighten teeth to give you a more attractive and healthier smile. When wearing Invisalign clear braces from our Creve Coeur dental office, you’ll notice the gradual change over the course of an average treatment time of a year and a half. Each time your smile has adjusted to the fit of the current aligner, you switch to the next clear orthodontic aligner in the series, which will then adjust your smile a bit more. The clear braces are removable, so you can practice regular oral hygiene habits and eat whatever you like without difficulty. Adults also love Invisalign orthodontics because they will most likely never be noticed by friends or coworkers. Traditional braces are associated with adolescence, and you don’t want your smile to have that immature look. 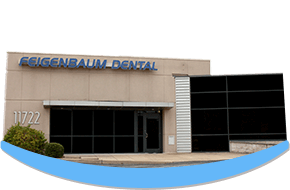 Instead, you can opt for Invisalign clear braces from Feigenbaum Dental in Creve Coeur, MO. Orthodontic treatment can help patients suffering with overbite, underbite, crossbite, and crooked teeth. With Invisalign clear braces, you can lessen your risk of TMJ problems, cavities, and gum disease, all of which are associated with tooth alignment issues. When your bite is misaligned, it can seriously affect your oral health and the function of your smile – fix the problem with Invisalign clear braces.